Orange Glen H.S. 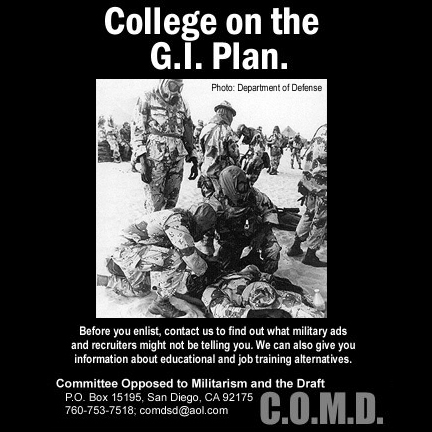 backs down on its counter-recruitment ad ban after getting letter from COMD's attorney. 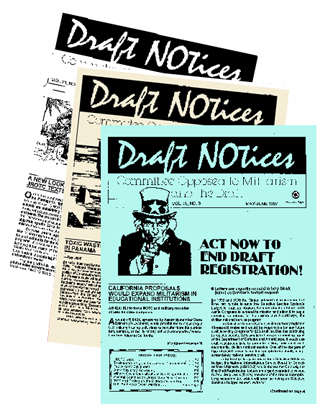 With only one issue of the student newspaper left in the school year, the Orange Glen High School administration apparently decided it could not defend an earlier decision to reject a counter-recruitment ad submitted by COMD (see May-June 2000 issue of Draft NOtices). The ad, sponsored by Orange Glen alumni Gary Ghirardi and Michael Boone, was submitted to the school newspaper staff in February. 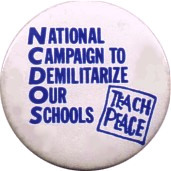 It was similar in theme to dozens of other ads COMD had placed in high school papers over the last 18 years. In the center was a photo of an injured soldier being helped on a battlefield, and above it was the headline: "College on the G.I. Plan." The rest of the text said: "Before you enlist, contact us to find out what military ads and recruiters might not be telling you. We can also give you information about educational and job training alternatives." Rather than allow the students to decide whether to accept this ad, the journalism advisor and school administration intervened and sent COMD a rejection letter. Attached was a copy of a school district policy that prohibits schools from distributing "materials" that promote any particular commercial, religious or political interest. 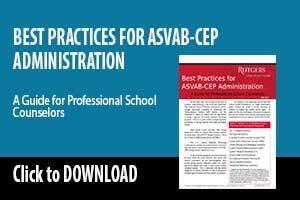 Another part of the policy prohibits "advertisements which are inconsistent with school objectives or do not reasonably relate to the educational purpose of school-sponsored publications." Four years of involvement with counter-recruiting issues in the Shoreline School District has uncovered a number of sexual harassment cases involving U.S. Army recruiters and female high school students. If not for the close scrutiny recruiters were receiving from activists and the media, it is doubtful the incidents of sexual harassment would have been made public. The question remains — how common is the sexual harassment of female students in our schools by military recruiters? Shoreline School District has two high schools and is located immediately north of Seattle. The neighborhoods in the district are middle to upper-middle class. Generally, military service is viewed as not the best choice here, but an acceptable choice for some. In 1995, parents of students at Shorecrest High School asked for equal access for activists with an alternative view to military service. 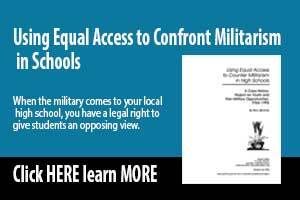 We had discovered that military recruiters had no restrictions on access to students in the district. 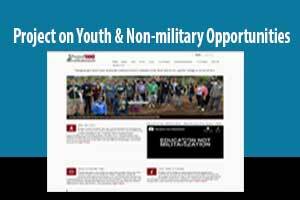 Recruiters could be seen in the gym after school and uniformed soldiers even instructed some of the class periods, but the schools would not allow leaflets with an opposing view to military service in the career centers. 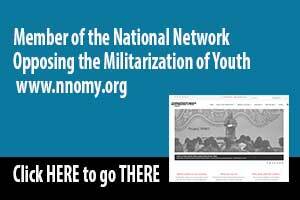 Eventually, the media became interested in our efforts and began carrying articles about military recruitment in public schools. Finally, in June 1997, Shorecrest High School agreed to allow us to display four different leaflets in its career center. WAR AND EDUCATION: A GOOD MIX? - Ken Larsen, Friends Committee on Legislation of Calif. Most Californians probably don’t know that our state has an agency called the "Military Department" and that it is slated for a 58% budget increase in these times of peace and prosperity. Traditionally, the Military Department’s job has been to manage the California Army and Air National Guard, the state’s reserve forces for times of war, insurrection and disaster. But Governor Gray Davis has come up with a new mission for the state’s military. He wants the National Guard not only to prepare for catastrophe, but also to take over the education of difficult young people. The governor’s 2000-2001 fiscal year budget asks the legislature to approve $10.5 million in funding for two new paramilitary training institutions. Both the Turning Point Academy and the Oakland Military Academy set dangerous and wasteful policy precedents. Read more: WAR AND EDUCATION: A GOOD MIX?